1) Login to the Sharepoint Server with Server Administrator permissions. 2) Run the installer on the server. 3) Once the installation is complete, the Nintex Workflow 2007 wsp’s should be visible in the Solution Management in Central Administration. 4) Deploy both the solution files to all web applications in the farm. 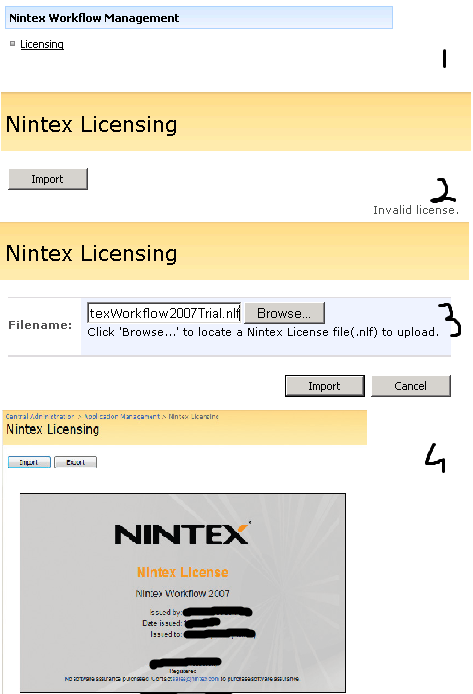 5) On completion of this, we have to import the Nintex license to Central Administration.I have listed the sequence below on how to do this. 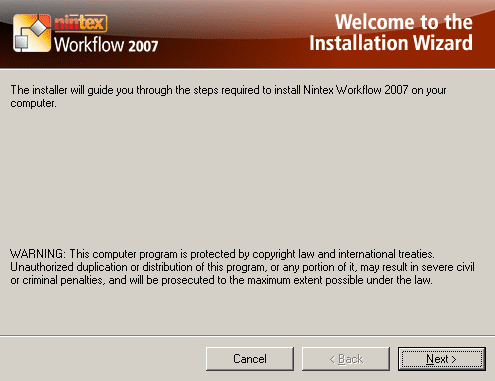 6) We can start with the database configuration for Nintex Workflow 2007 after this. 1. In Central Administration, click on Application Management tab. 2. 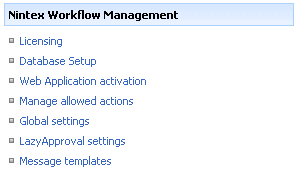 Below Nintex Workflow Management, click Database Setup. 3. Click the Create below Configuration Database. 4. Enter database server name.The database name for Nintex is given by default.Click OK.You have completed the Nintex installation now. P.S. : Nintex can use multiple databases, one for configuration and others for content. By default the configuration database is also the content database. More databases can be added if needed.